They say the formbook goes out of the window when it comes to the FA Cup. And if that statement is true, then it may be no bad thing for Corby Town. 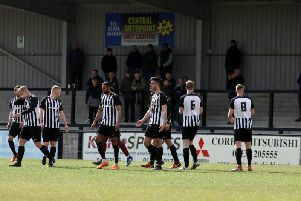 The Steelmen face a tricky second qualifying round clash against Evo-Stik Northern League Premier Division side Rushall Olympic at Steel Park on Saturday. And Tommy Wright’s team could really do with a win to spark their season back into life. Tuesday’s 2-1 defeat at Kettering Town in the NFA Hillier Senior Cup made it seven games without a win and four losses in a row after they went down 3-0 at home to Worcester City in the Vanarama National League North. Throw in the fact they fell to lower-ranked opposition in the form of Norton United, after a replay, at the same stage last season, and it makes for a slightly concerning situation. Wright admitted he will give his players a polite reminder of what happened this time last year ahead of Saturday’s clash. But he insists his team are more than capable of getting the job done as long as the players are “at it”. The Stelmen boss said: “It will be tough. They (Rushall) will fancy their chances. “They lost in the league on Tuesday night but everyone knows that when it comes to the FA Cup, nothing that has happened before really matters. “The formbook goes out of the window and teams from lower levels are looking to cause a shock. “It is going to be a very tough game. But like I have said over again, if our boys are at it then I will back them against anyone. “They will be reminded of what happened last year. “We got ourselves 3-1 up but if you switch off for the last 10 minutes then you find yourselves in a replay and I knew we would be in trouble because we were going to a ground that the boys wouldn’t have fancied. “We don’t want the same thing to happen this time. I have been Rushall’s ground and it’s not the sort that will inspire you. Herve Pepe-N’Goma will be in the Steelmen squad after the centre-half re-signed for the club this week following his release from Nuneaton Town. Corby are awaiting international clearance for former St Mirren striker Callum Ball, who also joined this week. Greg Mills remains a doubt for the clash after suffering an ankle injury in the defeat to Worcester last weekend but Leicester City loan duo Aaron Hassell and Cedric Kipre are expected to be fit, despite taking knocks in the loss at Kettering.